did not reach 19 years of age prior to that August 1 immediately before the beginning of the seasonal year for which the individual is being nominated. Phone: 808-429-6649 (home/Cell); Email: delgadod002@hawaii.rr.com (e-mail). Yamanouchi - 2013 Region IV Young Referee of the Year! 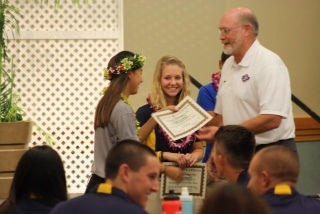 Congratulations to Hawaii's Tiffany Yamanouchi on her selection as US Youth Soccer Region IV Female Young Referee of the Year..
Championships held here in Hawaii in June of 2013. Both Tiff and Zach will represent Hawaii as nominees for Region IV and will be recognized at Far West Regionals 2013.